June is LGBTQ Pride Month, and we are celebrating with a special display. Come check out a book from our StudentsAWARE Health Equity Collection. 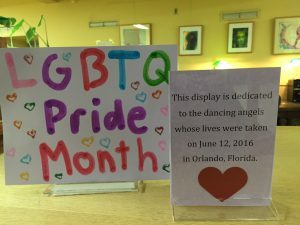 This year the display is dedicated to our brothers and sisters killed in the Pulse nightclub shooting on June 12, 2016. Evening & Weekend Library Supervisor Jenny Kim hand-lettered 49 hearts with their names in commemoration of their lives.